BELLEVILLE, New Jersey (WABC) -- Four New Jersey police officers and a civilian have been arrested months after a bar fight, Bergen County Prosecutor Gurbir S. Grewal said Tuesday. The Prosecutor's Office says it was notified on Halloween that a number of off-duty Belleville police officers were involved in a fight at a bar in North Arlington on Oct. 21. Investigators say the brawl continued outside the establishment until police from North Arlington and Lyndhurst took control. A civilian sustained minor injuries. No one was charged until the prosecutor found Officer John Clarizio provided false information. Clarizio is charged with hindering apprehension and simple assault. 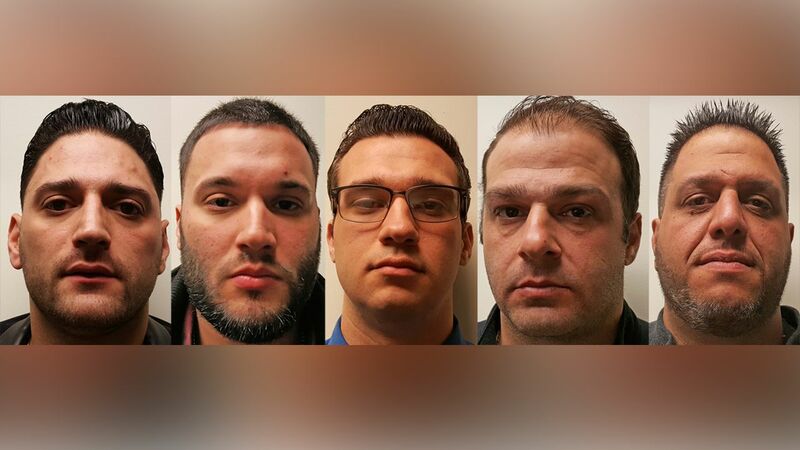 Officers Marco Zarfino, Jesse McKeough and Giovanni Casillo are charged with simple assault. Authorities also charged 39-year-old Vasilos Theofandis with simple assault. It's not known if they have lawyers who can comment. Belleville Police Chief Mark Manchini says all officers were suspended immediately without pay. Pending the outcome of the court case, the officers would face follow up administrative charges in Belleville.